The well-known and historic Aurlandsdalen Valley, was once one of the main routes between the eastern and western parts of Norway. The area known as Norway’s Grand Canyon, is wild and breathtaking, rich in plant and animal life, cultural treasures, history and geological features. The hike stretches from Østerbø to Vassbygdi. It is considered to be a day’s hike of 6-8 hours. Here you will find an Aurlandsdalen Valley untouched by power project developments or other modern interventions in nature and landscapes. The path takes you past canyons and gorges, down steep slopes, surrounded by high and ragged mountain formations and it is an unforgettable experience for walkers. One should stop at the sites of the old farms of Nesbø, Sinjarheim and Almen. Many of the old houses are still there and pay witness to times past. There are many sayings and stories connected to the more unusual names of places one meets on the road. Worth mentioning is the strange rock cauldron with a tarn, named Vetlahelvete – little hell. Day 1: Østerbø Fjellstove: 3-course dinner and accommodation. Day 2: Breakfast. Hike in the Aurlandsdalen valley from Østerbø to Vassbygdi. Packed lunch and flask. “After hike” at Ægir BrewPub! Flåmsbrygga Hotel: 3-course dinner and accommodation. The hike in the Aurlandsdalen valley is unaccompanied. Price: 2 days from Nok 2725 per person. Time: Actual hiking time is between 6-8 hours. Distance: Hike is a total of 20 km in length. Basic hiking experience recommended, medium fitness level required to complete the hike. Not recommended if you have knee or back issues. Explore the area and enjoy beautiful views of Flåm! All ages welcome. Good shoes are recommended. Hike with guide is only available on request. Distance: Hike is a total of 18 km in length. Height difference: Maximum altitude will be 866 meters. Downhill hike. Panorama view of the Aurlandsfjord! Our excursion starts with a drive from Flåm to Stegastein Viewpoint in our comfortable minivan. Enjoy beautiful views from the famous viewpoint before we continue the drive further up the road to the car park. From here, a well trodden path leads up the north edge of the mountain towards Mt. Prest. The hike is steep uphill, with considerably steep drops on the fjord (west) side of the track. At around 1000m height, there is a steeper section where the track narrows to a path with loose stones. After passing this, you begin to be rewarded with even better views of the fjord. Also, the cairn at 1363mas. comes into view above you. The path is wider and easier on the final stretch to the cairn. This part of the mountain is called Røyrgrind and this is where many choose to complete the hike. The cairn is an impressive size, and there is a little box with a notebook where you can leave a record of your visit. 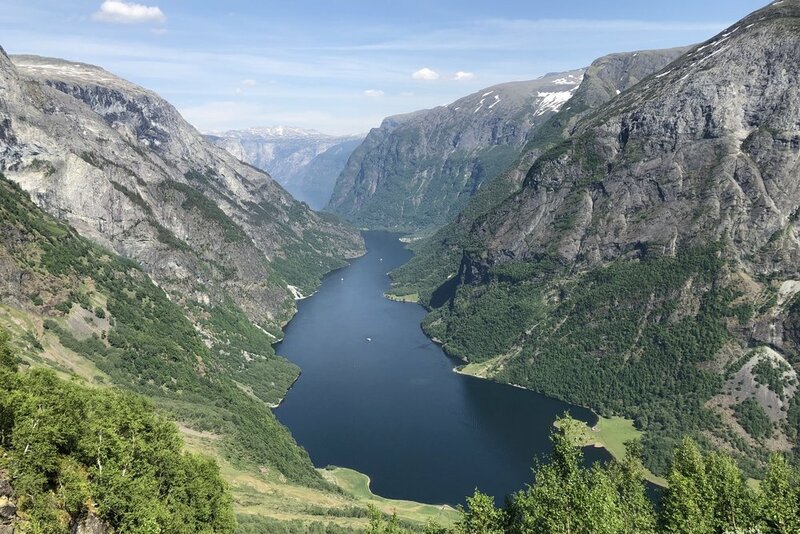 Breath in the fresh mountain air, enjoy a Norwegian hiking treat and take your fjord view selfie before we make our way back the same way towards Flåm. Time: 5hours (start and end in Flåm). Actual hiking time 4 hours. Distance: 6,5 km hike/ Height difference: Ca. 545m. The hike is steep and requires medium fitness level. Not recommended if you have knee or back issues. Good shoes and outdoor clothing. Panorama view of the UNESCO listed Nærøyfjord! We go by minivan from Flåm to the tiny village Bakka situated by the majestic Nærøyfjord. From here, we start our hike up Rimstigen. Rimstigen is an old trail that was used by farmers living along the Nærøyfjord when the only way to connect to nearby villages and cities was over the mountains. Rimstigen is the steepest trail in the area with a climb of 720 meters in just over 2km of trail. The hike is challenging and steep uphill, with high drops on the fjord side of the track. Enjoy fantastic views as you get to the top of Rimstigen, breath in the fresh air and make sure to take some pictures before we hike downhill the same trail. Time: 5-6 hours. Actual hiking time roundtrip is about 4-5 hours . Distance: 5 km hike / Height difference: 720m. We go by minivan from Flåm to the farm Vikesland (460masl). We follow the trail from Vikesland to the old mountain farm Hovdungo. Hovdungo is situated 780 metres above the beautiful Aurlandsfjord, and you get to enjoy spectacular views of the fjord – and mountain landscape. The hike is medium challenging, however some parts of the trail is very steep. On top you get awarded with one of the best fjord views in the area, before we make our way back on the same trail. Time: 4 hours (start and end in Flåm). Actual hiking time is 3 hours. Distance: 5,4 km hike / Height difference: Ca. 320m.